Fife-based Graeme McDougall is the new Scottish Young Professionals’ champion after overcoming two double-bogeys in the closing round to claim the title at West Lothian. McDougall, who is one of Gavin Cook’s assistants at the Golf House Club in Elie, started the final day sitting two shots off the lead, held by Bathgate’s Chris Curran. After a third-round 68, he’d moved into second, one behind Thomas Higson of Gleneagles Hotel, as Curran’s challange came unstuck. 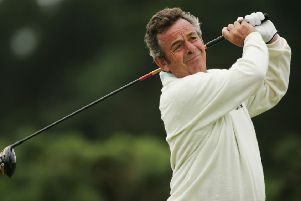 McDougall, who played his amateur golf at Bishopbriggs, swept into the lead after picking up three birdies in the first seven holes in the final round. He then ran up 6s at both the ninth and 13th before crucially repairing part of that damage with birdies at the 14th. A closing 70 saw him finish with an eight-under-par 276 total, winning by a shot from Higson (72) and Pumpherston’s James Steven (68). Higson, bidding to follow up his win in a Young Pros’ Order of Merit Sprint Series event at Duddingston. had birdies at the fourth and 12th in the final round before closing with five pars. Steven, meanwhile, started for home birdie-birdie in final round before dropping a shot at the 14th but then made birdies at the 16th and 17th. On a day when Curran slipped to 13th after closing with rounds of 76 and 78, former European Tour player Steven O’Hara (North Lanarkshire Leisure Ltd) finished fourth on four-under. Elsewhere, all three Scots to make the match-play phase of the Ladies’ British Amateur Championship bowed out in the opening two rounds at Hillside. Chloe Goadby (St Regulus) and Hannah McCook (Grantown-on-Spey) went down by one hole and 4&3 to Priscilla Scmid (Switzerland) and Bethan Morris (Wales) respectively in the first round. Gemma Batty, the Scottish champion from West Linton, won 3&2 against Norway’s Dorthea Forbrigd at that stage before losing 5&4 to Emilie Alba Paltrinieri from Italy in the afternoon. On the Challenge Tour, Jack McDonald made a promising start in the Made in Denmark Challenge at Himmerland with a three-under-par 68. That left the Ayrshireman sitting four shots off the lead in joint-12th, ahead of newly-crowned SSE Scottish Hydro Challenge champion David Law as the Aberdonian opened with a 72. Young won last week’s event at Clevedon, near Bristol, before also passing one of the Open Championship regional qualifying tests earlier this week. Joint-overnight leader Sean Lawrie is seven shots off the pace in the 54-hole event after following his opening 65 with a 72.